He found Watson near the Koi Pond in the atrium where the city’s moneyed set meet over power lunches or high teas. With Watson sat “Killer” Ximba, a notorious former Hawks member who is now head of security for the Ekhurhuleni municipality. In Ximba’s bag, Agrizzi said he saw a Colt-45 with a pearl handle that the cop proudly showed off. It seemed to be a warning, said Agrizzi of “what would happen if you didn’t do what was told to you”. Agrizzi submitted a six-minute video to the Commission of Inquiry into State Capture which blew the lid on grand corruption at Bosasa as it provided video evidence of how Watson and four other senior executives engaged in the strategy of corruption at Bosasa, the multi-billion-rand facilities company at the heart of the story of State Capture. Agrizzi testified as to how Bosasa sustained its cult of corruption for so many years and of how dissenters were dealt with. Angelo Agrizzi says his hands were sore because of the amount of times he handled cash for bribes? Our country is a movie honestly. “Problems would have to leave. Salaries were cut. We were constantly told we were white males and that ‘you will not find a job anywhere’. As soon as you stopped doing what you were meant to, the wrath (of Watson) would fall on you. The blame would be put on those who had left. (It’s now said) I paid people,” Agrizzi told Judge Raymond Zondo who asked what had motivated the video being shot and released. Agrizzi alleged that any staff member who objected to the institutional corruption at Bosasa was isolated and marginalised. “First your office gets moved, (then) you get moved, you get fired. You don’t have the money to fight (or) the legal resources,” said Agrizzi. The video starts in the vault of the company secretary, Natasha Olivier, from where cash was packed out and boxed and walked through the Bosasa campus to Watson’s vault. Staff called Olivier’s vault “The Oven” where the bread (the cash) was baked and cooled, while Watson’s vault was called “The Shop”, from where the cash was moved to clients who helped Bosasa win contracts. Watson’s walk-in vault was Bosasa’s heart of darkness, the place where the bribes were prepared. In the video, you see Watson counting out a million rand with each stack of notes packed in R100,000 piles – there is a thud as he knocks and places each stack to reach R1m. In the vault with him were the company chairperson Joe Gumede and the spokesperson and a director, Papa Leshabane. In the course of the video, shot by Andries van Tonder, the then Chief Financial officer, the three men spoke in the coded language they used to plan payments. Agrizzi told the commission of inquiry that every contract at Bosasa was won through bribery so acute it was institutionalised and part of the company culture. Bags of money sealed in grey security purses moved through Bosasa all the time, said Agrizzi. “The grey bags were only used for cash. They were also used to give certain staff members an amount of R10,000 to R20,000 each to keep them quiet,” the former executive said. He explained that Bosasa paid their patrons, who swung contracts for them, in monthly bribe payments to ensure that the company’s contracts were renewed. 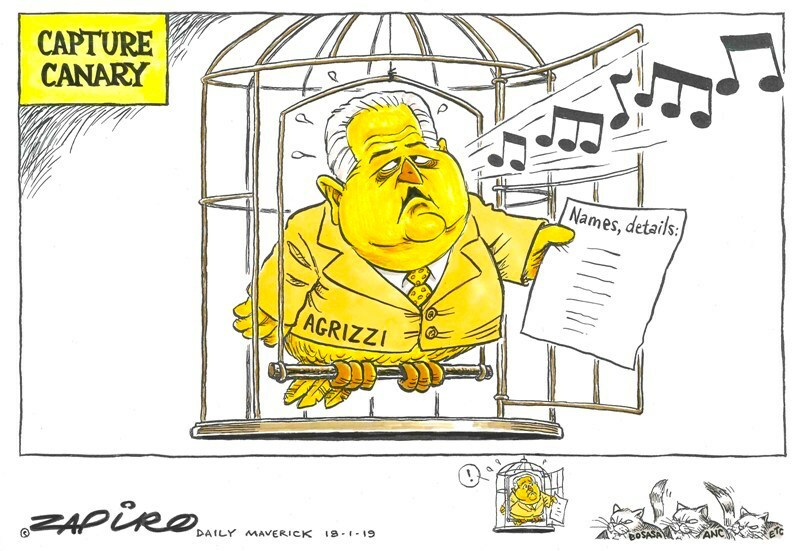 “Once you start paying people bribes on a monthly basis, you control them 100%,” said Agrizzi to explain why the company did not make one-off payments. “Every single contract (entered into by Bosasa) was tainted by bribery and corruption,” said the former Bosasa paymaster who is surrounded by a ring of four body protectors wherever he goes. The cash in Watson’s vault was laundered, alleged Agrizzi who said that Bosasa’s chief financial officer picked it up near a petrol station at Lanseria airport from dealers who got it from Zimbabwe or from gambling houses. The company paid a 15% premium for the wads of money which were called “Monopoly Money” by Watson. This referred both to how Bosasa tried to build a monopoly by winning all government tenders related to security, catering and other forms of facilities management and also to how useless the money was in the legal economy – it was like the notes from the game Monopoly. The commission was due to resume after the lunch break but was unexpectedly adjourned on Thursday due to what deputy chief justice and state capture chairperson Judge Raymond Zondo called a “security situation”. Earlier, Agrizzi told the commission that he had on Wednesday seen a former SAPS colonel, Solomon Segale at the commission’s hearings in Hillbrow, Johannesburg. He said that Segale, Bosasa’s special operations manager, had gained access using an expired police officer’s card. Zondo said hearings would resume on Friday and he warned that nobody would be prevented from giving testimony. Agrizzi is under witness protection and attends each hearing surrounded by four bodyguards.